The Olympus E-3 (announced 16 October 2007) is the top of the line DLSR from Olympus. The E-3 features a 10.1 megapixel Live MOS image sensor (with live preview), five frames per second shooting, 2.5 inch LCD (able to be tilted and swiveled) and 11 point auto focus sensor. It has a shutter speed range of up to 1/8000 second and takes both Type II CompactFlash and xD-Picture cards. It also features a 100% accurate high eyepoint optical viewfinder, dust reduction system and rugged magnesium alloy construction. E-3 Digital SLR Combined with Zuiko Digital Specific SWD 12-60mm (24-120mm Equivalent) Lens Delivers Fastest AutoFocus Technology to Photographers. Speed: When coupled with three new ZUIKO DIGITAL Supersonic Wave Drive™ Lenses (SWD) announced today, like the ED 12-60mm f2.8-4.0 (24-120mm equivalent), the E-3 offers unmatched AF speeds, and the fastest AF speed in the world with that lens.1 It employs a newly-developed high speed 11-point biaxial cross type AF system, 5 frames-per-second continuous shooting, and 1/8000 second top shutter speed for the quickness required in any shooting situation. Superior Image Quality: In-Body Mechanical Image Stabilization with Supersonic Wave Drive technology ensures blur-free images for all lenses attached to the E-3, so now even low-light telephoto shots are clear and sharp when holding the camera in shaky hands. Its 10-megapixel Live MOS Image Sensor delivers high-resolution images for large format print sizes, and TruePic III™ digital processing engine ensures high-speed image processing, accurate color and improved detail with low noise. The camera’s interior components combined with digital-specific lenses offer the edge-to-edge crystal clarity that only 100 percent digital optics can provide. Swivel Live View LCD: A dual-axis swivel 2.5-inch Live View LCD covers all the viewing angles from low to high and side to side, to assure accurate composition. Real-time image monitoring of white balance and exposure enables greater creative control of settings to secure the best possible photograph. Reliability: The E-3’s large optical viewfinder provides a 100 percent accurate view and its 1.15x magnification makes it one of the largest and most accurate viewfinders for reliable composition. The proven effective built-in Dust Reduction System with the Supersonic Wave Filter eliminates spots from photos. A durable shutter mechanism with the lifespan of 150,000 exposures meets the demands of serious photographers. Also, the E-3’s sealed magnesium alloy chassis is completely splash-proof and dust-proof for use with pro lenses on expeditions to the most extreme environments on the planet. When it comes to measuring camera speed, autofocus is a key factor. If a camera’s AF system does not meet photographers’ demands and lock focus accurately and quickly, they will miss shots regardless of the camera’s shot-to-shot speed or start-up time. The E-3’s new AF system is the world’s fastest in combination with the ZUIKO DIGITAL SWD ED 12-60mm f2.8-4.0 lens, to ensure fast focus for clear, sharp photos. Additionally, every lens attached to the E-3 benefits from faster AF, not just the SWD lenses, so the E-3 can lock focus on a fast-moving subject and capture that once-in-a-lifetime shot. The secret to the camera’s high-speed focusing is a unique Twin cross type (fully biaxial) 11 point AF sensor, based on proprietary Olympus micro-sensing technologies, that achieves equally effective performance on both the vertical and horizontal axis. With most biaxial sensors, performance on the vertical and horizontal axes is not equal, and there is often a perceived difference in response time when using different lenses. However, unlike systems that respond at nominally lower f-stop values simply by boosting sensitivity, the E-3’s AF sensor features a totally redesigned hounds tooth-pattern phase detection sensor layout that uses micro-lamination technologies to achieve superior real-world performance. AF accuracy is further ensured by precise alignment of the optical axis from the lens to the AF phase detection sensors, and accurate mounting of the sensors within the AF unit. The AF unit used in the E-3 is made of high-tensile engineering plastic, which is further protected by the camera’s high-rigidity magnesium body. In addition, data from a dedicated temperature sensor is used to compensate for changes in operating temperature. The 11 AF target points on the E-3 can be selected to work individually or dynamically in combination with adjacent target points. Once a photographer knows the general direction of a moving subject – a Formula One racecar zooming around a track for example – the AF area can be selected based on the anticipated motion to maintain accuracy. The newly developed Olympus Supersonic Wave Drive (SWD) lenses on the E-3 enable auto focusing at ultra-high speed with precise and quiet operation. Quietness is essential when shooting in a situation where silence is truly golden, such as photographing exotic birds up close in the wild or musicians at a classical music quartet. But this technology truly shines in combination with three new Olympus ZUIKO DIGITAL SWD lenses that employ Supersonic Wave Drive motor technology inside: the ED 12-60mm f2.8-4.0 SWD (24-120mm equivalent); ED 50-200mm f2.8-3.5 SWD (100-400mm equivalent), and the ED 14-35mm f2.0 SWD (28-70mm equivalent). The new ED 50-200mm f2.8-3.5 SWD lens focuses twice as fast as the previous ZUIKO DIGITAL lens with that focal length, and the new ED 14-35mm f2.0 joins the existing 35-100mm f2.0 (70-200mm equivalant) as the brightest lenses in their class. Mechanical focusing is also available for easy and accurate manual focusing by hand. The E-3 can capture images at the highest image-quality setting at a rate of 5 frames per second. With shutter speeds of up 1/8000 second, it is possible to freeze action when photographing a cheetah in fast pursuit across the plain, or a fastball before it connects with the bat. To prevent image blur caused by camera shake, which can occur in dim lighting or with longer telephoto lenses, the E-3 employs In-body Mechanical Image Stabilization, which compensates for camera movement up to 5 steps EV and delivers blur-free images taken with any of the ZUIKO DIGITAL lenses available for the camera. Moreover, built-in SWD Image Stabilization offers the advantage of image stabilization for every lens attached to the camera body, so there is no need to purchase image stabilized lenses at a premium price. At the heart of the built-in image stabilizer unit are the Olympus-exclusive Supersonic Wave Drive motors with excellent responsiveness and control. The motors use information about camera shake gathered by a gyro sensor that detects and analyzes hand vibrations, and move the image sensor with a piezoelectric element. The E-3’s high-performance Live MOS image sensor delivers excellent dynamic range, accurate color fidelity, and a new state-of-the-art amplifier circuit to eradicate noise and capture fine image details in both highlight and shadow areas. The camera’s Live MOS image sensor is complemented by Olympus’ TruePic III Image Processor that produces crystal clear photos using all the pixel information for each image to provide the best digital images possible with accurate natural color, true-to-life flesh tones, brilliant blue skies and precise tonal expression in between. TruePic III also lowers image noise in images shot at higher ISO settings, enabling great results in low-light situations. 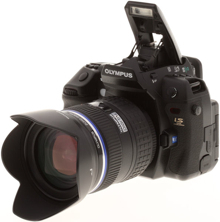 Olympus Live View empowers users to easily compose their subjects live on the LCD and see precisely how the settings they select impact the image before the shutter is released and the image is captured. By altering settings like white balance and exposure, and visually confirming how these changes affect the final image, this real-time monitoring offers a level of versatility and creative control that cannot be achieved by other digital SLR cameras that only offer an optical viewfinder. The E-3’s 100 percent accurate swivel Live View HyperCrystal™ LCD can be rotated freely so photographers can compose with the camera held overhead or down low, enabling them to take shots from angles impossible until now without feeling like a contortionist. Because Live View enables an E-3 photographer to communicate face-to-face with subjects and still have everything in the frame with the camera body out of the way, an encouraging smile or wink of the eye can be used with a shy or nervous subject to get the desired results. Live View provides an advantage for everyone who enjoys taking extreme close up macro shots, when composing on an optical viewfinder may be awkward, because it provides a magnification of the subject right on the LCD by a factor of 5, 7 or 10 times for sharp, pinpoint focus. The E-3 will also enable photographers to see over barriers because its swiveling LCD panel keeps subjects in view even with the camera held overhead. The bright 2.5-inch adjustable LCD displays 230,000 pixels in vivid color and includes HyperCrystal™ technology, which offers many times the contrast of conventional LCD monitors for easier viewing in both preview and playback. It also provides a wide viewing angle of 170 degrees, which ensures images can be composed from even the most obscure angles. The 2.5 inch LCD makes viewing icons and text on the camera’s menu a squint-free process. The E-3 employs a large, easy-to-see optical viewfinder with 1.15x magnification and 100 percent accuracy. Photographers can rely on the E-3 to capture exactly what they compose through the optical viewfinder, so they aren’t disappointed when viewing images back at the computer. This optical viewfinder also both reduces eyestrain and makes manual focusing easier. Olympus’ proven Dust Reduction System produces spot-free photos with the exclusive Supersonic Wave Filter™. The patented ultrasonic technology physically vibrates to remove dust and other particles from the front of the image sensor, and captures the debris on a special adhesive membrane every time you turn on the camera. It can even remove dust attached by intermolecular force that cannot be removed by physical vibration or by discharging static electricity. These spot-free photos liberate users from hours spent retouching photographs at the computer or sending their cameras back to the manufacturer to remove dust trapped inside. The E-3 is the ideal combination of strength and mass, and was built with a new casting technology to create a stronger magnesium chassis for greater durability. The camera is also sealed to make it splash-proof and dust-proof, and when used with Pro lenses it is sealed from the elements to perform in the most rugged conditions. Its classic penta-mirror design is portable enough to comfortably shoot with all day, and measures 5.59 inches (142mm) by 4.56 inches (116mm) by 2.93 inches (74.5mm), excluding protrusions, and weighs 28.2 ounces (800 grams) body only. Photographers will experience unparalleled ease of use – from menus that make sense and buttons on the body that are easy to understand and operate for total manual control, to customizable settings for every imaginable situation. Moreover, the camera’s durable shutter mechanism is rated up to 150,000 cycles, so it will withstand heavy day-to-day use. To coincide with the launch of the E-3, Olympus is releasing several new accessories for the E-System. The HLD-4 Power Battery Holder can hold up to two Lithium Ion BLM-1 batteries to extend the performance life of the E-3 and its existing BLM-1 battery. It also enables effortless vertical shooting with its own separate shutter button, two control dials, and dedicated Function and AF target buttons. Like the E-3 body, the battery holder is splash-proof and dust-proof to endure severe climates. The FL-50R and FL-36R are new wireless electronic flashes designed exclusively for digital photography. Their light emitting and brightness control circuitry achieve uniform illumination in the picture area and high brightness control accuracy. Both flashes have a rotary head that can be rotated in four directions. When these flashes are used in combination with the E-3, which features a commander function incorporated in its built-in flash, wireless multi-flash photography is possible without using an outside commander. The E-3 can control up to three wireless flashing groups independently, and control of multiple flashes is possible even in an environment in which both the FL-50R and FL-36R coexist. In addition, the centralized control/display system makes it possible to enter and check all of the selected items on the E-3’s Super Control Panel LCD. This ensures excellent operability and mobility. This entry was posted in Olympus and tagged Olympus, Olympus E Series on March 12, 2008 by jonathanb.